Hawaii’s Akamai internship program continues to successfully prepare local undergraduates for local jobs in science, engineering, and technology. 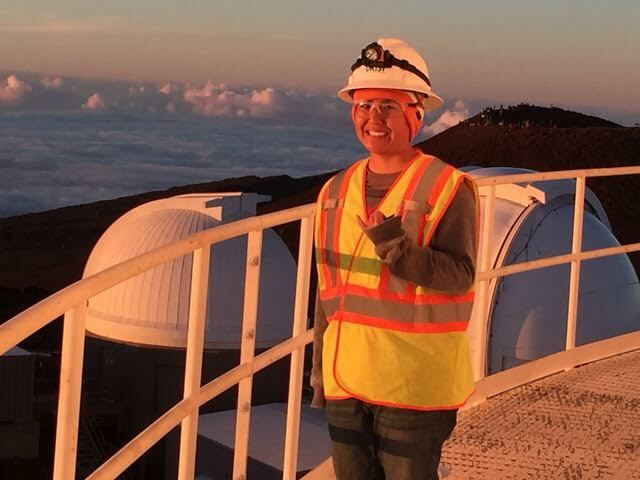 Most recently, Brialyn Onodera, a two-time Akamai alumna, was hired full-time with DKIST (Daniel K. Inouye Solar Telescope), under construction on the top of Haleakala, Maui, as an assistant engineer. Brialyn was born and raised on Hawaii Island in Hilo, graduating from Kamehameha Schools Hawaii. She recently received a bachelor’s in mechanical engineering in 2017 from the University of Hawaii at Manoa. While attending UH Manoa, she participated in the Akamai summer internship twice, in 2015 with the W.M. Keck Observatory in Waimea on Hawaii Island, and again in 2016 with DKIST on Maui. At DKIST, Brialyn worked with William McBride to identify vibration sources that could impact the quality of images taken by the telescope and determine how the impact of these vibrations could be computationally modeled with the hope that during construction, engineers can find places and ways to dampen these vibrations. Telescopes in Hawaii have been actively engaged in preparing local college students for jobs for many years, and it’s making a difference. In partnership with Akamai, 226 interns have been placed at telescopes, and another 130 in astronomy and related high tech industry in Hawaii. “Brialyn’s story is exactly what Akamai strives for. Providing local students with internships that lead to good jobs with telescopes is what we designed the program to do,” said Lisa Hunter, Akamai’s Director. The Akamai internship program offers college students from Hawaii an opportunity to gain a summer work experience at an observatory, company or technical facility in Hawaii. Upon acceptance into the program, interns are carefully matched with a project and a mentor who will supervise the intern in a 7-week project, and integrate the intern into the work environment. It prepares mentors to be effective, and helps mentors create projects that are both educational and valuable contributions to the host site. It is comprised of an accomplished staff teamthat works with interns and mentors all summer to provide an exceptional internship experience. After completing the program, interns are invited back for occasional workshops, connected to job opportunities, and may apply for a second internship. Akamai partners with, and has placements at all the major telescopes in Hawaii, including telescopes under construction like DKIST or planned for the future such as the Thirty Meter Telescope International Observatory. Akamai alumni get jobs: Brialyn is now part of a group of more than a hundred alumni who are now in jobs in Hawaii and beyond. For more information, please visit our website: akamaihawaii.org. Akamai is led by the Institute for Scientist & Engineer Educators (ISEE), and more information about ISEE’s partnerships with telescope facilities can be found here: isee-telescope-workforce.org, more specifically for the partnership with the Daniel K. Inouye Solar Telescope. Major funders of the Akamai program are: Thirty Meter Telescope, Daniel K. Inouye Solar Telescope, Air Force Office of Scientific Research, Hawaii Community Foundation (more information on Akamai’s funding is available).